Thinking about what Strahan said in the introduction, Meeting Infinity appears to be about what it means to be human. Or, more accurately, what it will mean to be human in the future after scarcely imaginable technological, social, and cultural advances, breakdowns, and changes. 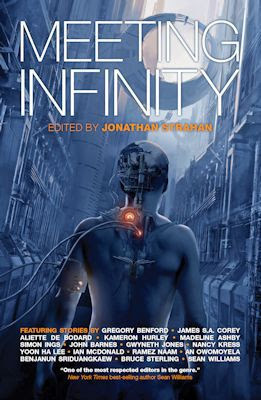 From the post apocalyptic and mechanical human wastelands of Sriduangkaew and Benford's stories to the unrecognizable AI of Yoon Ha Lee to the changing of bodies of Corey and Ashby to the medical advances of Barnes, Jonathan Strahan's Meeting Infinity offers a remarkably wide variety of possibilities of how the evolution of humanity might play out. The true standout story here is "Memento Mori" from Madeline Ashby. In this story, a noticeably longer life is possible because of the scientific advancements which have made body swapping possible. If you wish to forever remain thirty years old, you can do this, and if you wish to start fresh and erase all of your previous memories when you're changing bodies, you can do this, too. But, it isn't the concept of the story which causes "Memento Mori" to stand out, it is the raw humanity of the characters which shines through. Even though this is not something I necessarily get to decide, the characters in "Memento Mori" come across as authentically and comprehensibly human. Perhaps part of the reason for this is because Ashby's story is set nearer in the future than many of the others. On the other hand, "The Cold Inequalities" from Yoon Ha Lee left me, for lack of a better word, cold. While not as insanely far future as some of the other stories in the collection ("All the Wrong Places", for example, ends up hundreds of thousands of years in the future), Lee's story feels (to me) the least recognizably human and thus, the story I am least able to form any sort of connection to. I can't tell you when "The Cold Inequalities" is set (nor can I with a half dozen other stories), but I think the story features one AI defending the memory bank of a colony ship against the degradation of time and semi-sentient viruses. It could be that these are actually human individuals driving the action, rather than being suspended in some sort of stasis, but to me it reads cold and more alien than even stories where humans have physically transformed into something unrecognizable. Even in anthology purportedly about humanity, a story does not inherently need to be set in the near future to be good or to be appreciated and it certainly does not need to necessarily feature recognizable humans for the same. The aforementioned "All the Wrong Places" from Sean Wallace stretches from a future not so completely incomprehensible where humanity is initially colonizing the solar system by sending explorers out through some matter transferring jumps from planet to planet all the way forward to hundreds of thousands of years in the future where the unnamed protagonist begins to not recognize what humanity has become. In this case, though, the change in humanity is not so much the point of the story as is the really awkward and creepy if we think about it at any length stalkerish following by the protagonist across words and millennia of the girlfriend he lost back in Australia in a more recognizable time. Likewise, James S.A. Corey's "Rates of Change" is similar to "Memento Mori" in that Corey features a modern recognizable society that has advanced to allow humanity to move from body to body. Unlike "Memento Mori", however, some of these body alterations can move into the direction of inhuman carapaces in order to experience new things that would have otherwise been impossible. "Rates of Change" is a warm story of a mother's lack of understanding or appreciation for her son's transformations even though she herself has changed bodies from the one she was born into. "And now Stefan wants to leave his bod - the body she'd given him, the one that had grown within her - in order to...what? Have an adventure with his friends?" "Rates of Change" is so much less about Stefan as it is about the dual responses of Stefan's parents in reacting to how Stefan is electing to change and, in this instance, the accident which befell him in this inhuman state. The story itself feels a bit incomplete, but it does demonstrate the "challenges that may be thrown at us" in the future and how humanity may change. While Meeting Infinity is the fourth volume in Jonathan Strahan's Infinity Project, no previous knowledge of the first three is required to jump in here. The anthologies are thematically linked as are the stories, but that is as far as it goes. After a fairly strong opening with "Rates of Change" and "Desert Lexicon", the first half of the book is perhaps less memorable and more forgettable, but midway through, beginning with Bruce Sterling's "Aspects" the general quality and memorability of the fiction begins to improve. Besides "Memento Mori", Aliette de Bodard's "In Blue Lily's Wake" and John Barnes' "My Last Bringback" are especially notable. As a collected whole, Meeting Infinity is a more than solid, if unspectacular, anthology. Penalties: -1 for a handful of forgettable stories, -1 for "The Cold Inequalities"
Nerd Coefficient: 7/10 "a mostly enjoyable experience" See more about our scoring system here.